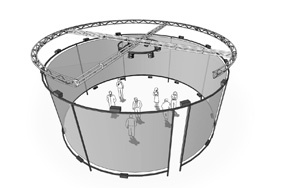 AVIE (the Advanced Visualisation and Interaction Environment) is the world's first artistically conceived 360 degree stereoscopic interactive visualisation and audification environment. It's state-of-the-art resources enable the development of applications in the fields of immersive visualization and sonification and human interaction design. 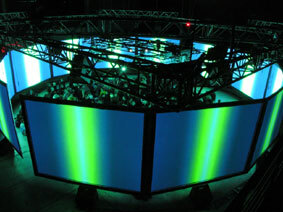 The basic AVIE configuration is a cylindrical silver projection screen 4 meters high and 10 meters in diameter. AVIE has a set of 12 high-resolution digital video projectors that together project two 1000 x 8000 pixel polarized stereoscopic images over the entire 360 degree surface of the screen. A 14.2 channel system with custom surround audio application software enables fully immersive 360-degree placement of sound anywhere around the viewers. 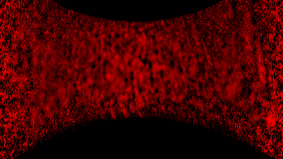 AVIE is part of a long history photographic and cinematographic panoramic experimentation that has been going on since the late 19th Century. 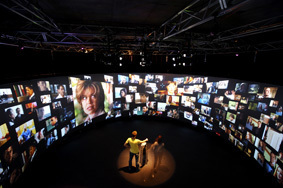 It is the culmination of over forty years of ground breaking artistic research done by Jeffrey Shaw in interactive immersive panoramic systems complemented by new research into narrative and software systems at the iCinema Centre. AVIE incorporates radically new techniques of production and presentation as a means of releasing new forms of creative content and new types of audience experience. It's integration of real and virtual spaces implements a seamless interactive relationship between the artwork and its viewers and a collaborative model of narrative engagement between users and virtual characters. This project was supported under the Australian Research Council's Discovery funding scheme (DP0556659) and by grants from the UNSW Capital Infrastructure Grants and Major Infrastructure Initiative Schemes and the UNSW School of Mining Engineering.